Valeo Service is the Aftermarket Specialist serving both auto manufacturers with original equipment spares and the independent aftermarket with replacement parts and accessories for passenger cars and commercial vehicles. Technical Specification Exhaust Emission Norm: Euro 5 Supplementary Article/Supplementary Info: with gaskets/seals Operating Mode: Electric Number of connectors: 5 Weight [kg]: 0.83. Equivalent Part Numbers VALEO: 700432, AUDI: 03GL128063L, 03L128063AD, 03L128063AF, 03L128063D, 03L128063E, 03L128063Q, AUTEX: 961070, DIPASPORT: FLAI012N, FLAI012R, FLAI093N, FLAI093R, FISPA: 88.073, 88.129, 88.129-2, HOFFER: 7519073, 7519139, IPD: 46-0065, MEAT & DORIA: 89073, 89139, SEAT: 03GL128063L, 03L128063AD, 03L128063AF, 03L128063D, 03L128063E, 03L128063Q, SIDAT: 88.073, 88.129, 88.129-2, SKODA: 03GL128063L, 03L128063AD, 03L128063E, 03L128063Q, vika: 11281014401, 11281482401, VW: 03GL128063L, 03L128063AD, 03L128063AF, 03L128063D, 03L128063E, 03L128063Q, WILMINK GROUP: WG1013579, WG1015140, WG1032386. The only way to be 100% sure that the part will fit your vehicle is to check the part number on your original unit matches one of the above. Any information in the compatibility table is for reference only and there may be unspecified choice options. If a part is faulty a replacement will be sent out after the return and testing of the old unit. Labour claims & consequential loss claims are never accepted. 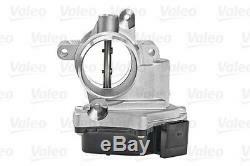 The item "Valeo Throttle Body 700432 BRAND NEW GENUINE 5 YEAR WARRANTY" is in sale since Tuesday, November 13, 2018. This item is in the category "Vehicle Parts & Accessories\Car Parts\Air Intake & Fuel Delivery\Throttle Bodies". The seller is "rtgroup11" and is located in PR25 3US. This item can be shipped to United Kingdom.